When the UK government cancelled its plans to electrify train lines across Wales, the Midlands and the north of England, and cut back on the Great Western rail network electrification, it brought a premature end to a rail investment programme once touted as the biggest the country had seen since the Victorian era. But now reports suggest that the government and train manufacturers are hoping there may be an alternative way to turn British railways electric: hydrogen. Hydrogen trains have already replaced more polluting diesel engines on a line in Germany, and some train companies think the vehicles could be running in Britain as early as 2022. Introducing them would still require substantial investment and wouldn't be without challenges. But they could be an important step towards reducing the carbon footprint of railways. Only around a third of the UK rail network has been electrified, with little extra track converted in the last few years. Without continuing to electrify the network, the government is faced with the dilemma of how to eliminate diesel trains that produce carbon dioxide and other harmful pollutants. The current strategy is to purchase bimodal trains that can switch to using diesel when they reach parts of the track without electricity. But this is fudging the issue of dealing with climate change and air pollution and still leaves the UK well behind most other European networks. If electrifying the rest of the network is deemed too expensive, one potential alternative is to generate electricity on board the train. 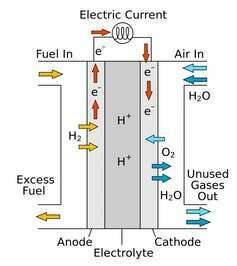 One way to do this is to use fuel cells that combine hydrogen gas with oxygen from the air to produce electricity and water. Hydrogen can carry more energy than the same weight of batteries, meaning fuel cell systems could be lighter. They also take less time to refuel than batteries take to recharge and don't have the same high environmental costs from manufacturing. The hydrogen gas would need to be compressed into tanks that would usually be stored on the train's roof. But adding a regenerative braking system to charge an additional small battery would reduce the amount of hydrogen needed to power the train. 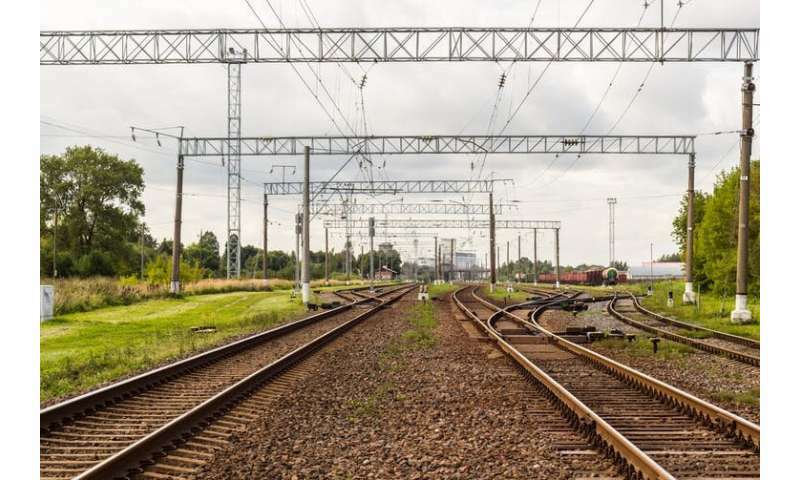 The high cost of installing overhead wires means that hydrogen trains would likely be a more economic way to electrify railway lines with relatively low volumes of traffic. And it makes sense to experiment with hydrogen trains to uncover any unexpected issues. But widespread use would require substantial investment in the generation and storage of hydrogen. Because very few hydrogen-based railways have ever been built, it's not clear if they would actually save governments any money over electrifying larger lines that would provide economy of scale. A better solution might be to develop bimodal trains that can switch between electricity from overhead wires and fuel cells. This would be especially suitable for the UK rail network, which has many bridges and tunnels that are too low to run overhead cables beneath and very expensive to replace. If electric trains could switch to hydrogen power for sections of track with bridges or tunnels rather than requiring cables, it could considerably reduce the cost of electrification. The other problem with hydrogen fuel cells is that the fuel is currently manufactured from methane (natural gas) using a process called steam methane reforming that also produces a large output of highly toxic carbon monoxide. This can be converted to carbon dioxide but that means using hydrogen fuel cells still contributes to greenhouse gas emissions. A pollution-free way of producing hydrogen is through electrolysis, by passing an electric current through water. In theory, you could use excess wind power (and perhaps solar) to generate this electricity and make the hydrogen a renewable energy source. The issue is that electrolysis plants are unlikely to be economic unless they run for a high proportion of the day. This would mean that when there wasn't excess wind to power them, they would need regular electricity from the grid that would make the process highly expensive (and not necessarily renewable). A second alternative is to use a "thermochemical" production method that involves reacting water with sulphur and iodine in the presence of heat. The good news is that this method is set to become economical within the next ten years thanks to the development of generation IV nuclear power plants. These high-temperature, small modular reactors are being developed in China, the US, Canada and Japan but not in the UK or Europe. Despite the current limits of hydrogen as a transport fuel, as more and more countries (in particular Japan) undertake further research on the hydrogen economy, its costs will fall substantially, just as they have for solar and wind power. Hydrogen could even eventually come to replace natural gas in mains gas pipes, which would help bring down the costs of using it for transport. The difficulty often seen in trying to introduce a new kind of transport fuel is that vehicle owners won't use it without the infrastructure to support it but infrastructure builders won't install it unless there is demand from vehicle owners. A government-funded experiment with hydrogen trains could help overcome this problem and bring the renewable hydrogen economy one step closer to reality.